Check out Metro Couture's many color options below. Introducing the Metro Couture Bag Collection from Petote! The leather trim and all leather Metro Couture bag is available in 5 cool colors. Choose from tangerine, black cherry, or toffee brown with leather trim and black (tan stitch) and toffee brown (white stitch) in all leather. The best selling Metro Couture bag is a pet carrier that looks just like a designer handbag! The Metro Couture bag has 2 front pockets plus a zipper pocket on the side, comfortable shoulder straps, and is approved for airline travel on most carriers. Petote Metro Couture bags are available in 3 sizes. Midnight Metro Bag with Tassel – The latest all leather designer dog carrier from industry leader Petote. The best selling Metro Bag has been updated with tassel detail. 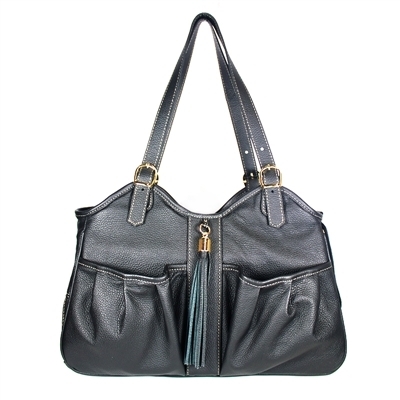 Leather tassel and gold plated hardware give this bag a designer handbag look. Made from soft black Italian leather with tan contrast stitching, and gold plated hardware. The Metro Bag has a roll-up side window, 3 mesh ventilation panels (top and both ends), inside adjustable safety hook, 2 deep outside pockets, 1 secure, zippered side pocket, faux fur bedding (machine washable), and lined with waterproof lining for easy cleanup. Large Metro Bag is a great option for carrying 2 small dogs. Large Metro Bag has 2 roll-up windows (one on each end). Petote Midnight Metro is airline approved and proudly made by hand in the USA.